Once host Bill Cosby left the stage at the fundraiser for the Riverside Theatre last Monday, John Coltrane's "Equinox" filled the Assembly Hall at the Riverside Church. 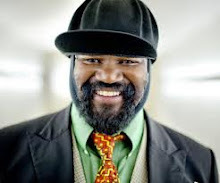 Vocalist Gregory Porter joined bassist Christian McBride, drummer Lewis Nash and pianist Donald Vega to sing his original lyrics to the song in honor of the legendary drummer Roy Haynes, 86. The other honoree, Cosby's TV wife Phylicia Rashad, was impressed enough to ask about Porter as she entered the gala's reception, where the singer's own quartet performed.